After slowly getting our wet weather gear on ( this was going to be a real test of it) we ambled out. The rain had stopped! The skies were clearing! 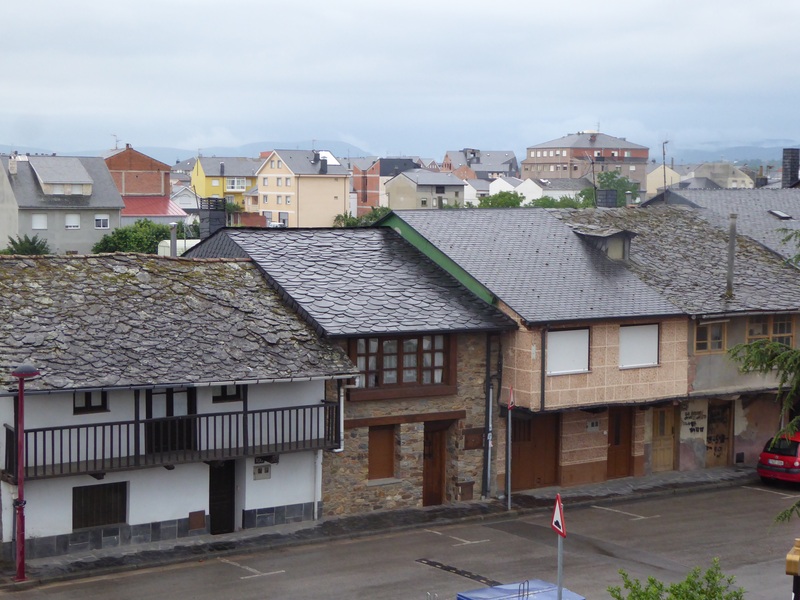 We walked the 10 Km, outfitted for rain, just in case, and arrived at Villafranca del Bierzo hot and sweating. Although the whole walk was next to a secondary road, as there was not much traffic it was fine. We enjoyed the vineyards, groves of chestnut trees, and well maintained vegetable gardens. For a short time a young Brazilian woman walked with us. She had gone to North Vancouver a few years ago as an au pair to learn English. She was lovely, but had only 10 days to get to Santiago so needed to maintain a pace much faster than ours! As you know Spain is a constitutional monarchy. It is dividedp into 50 provinces within 17 autonomous regions. The provinces are then divided into comarcas. Sometimes a province and an autonomous region have the same name which becomes confusing. The Camino passes through 4 regions: Navarra (including the Basque area), the Rioja, Castille a Leon, and Galacia, and 5 provinces: Burgos, Palencia, Leon, Lugo, and Coruna. It is no wonder pilgrims get lost😊 There are unique languages and histories to the areas and in some instances not everyone is content with the political designation. From the beginning we have seen posters and graffiti calling for a republic, independence, or reform.. Generally, from what we have been told none of these are strong movements. There is very high unemployment but not as much social unrest as you might expect. However, we are in a rural and relatively isolated part of Spain, which may temper this. This is the second floor of our beautiful hotel in Cacabelos, the green in the foreground is in fact the top side of an 8 foot ceiling of grape vines covering one of the ‘outdoor’ areas below. So many of the streets in Europe seem to be faced with buildings that come right to the sidewalk. 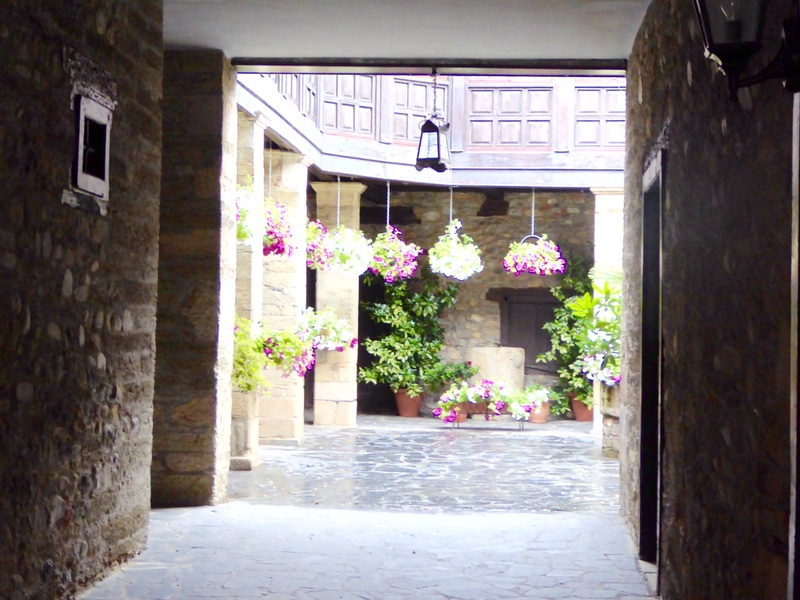 In fact behind the car and front entrance doors are entrance eays to beautiful courtyards. Here we are looking into a gardened area that is like a courtyard back garden. 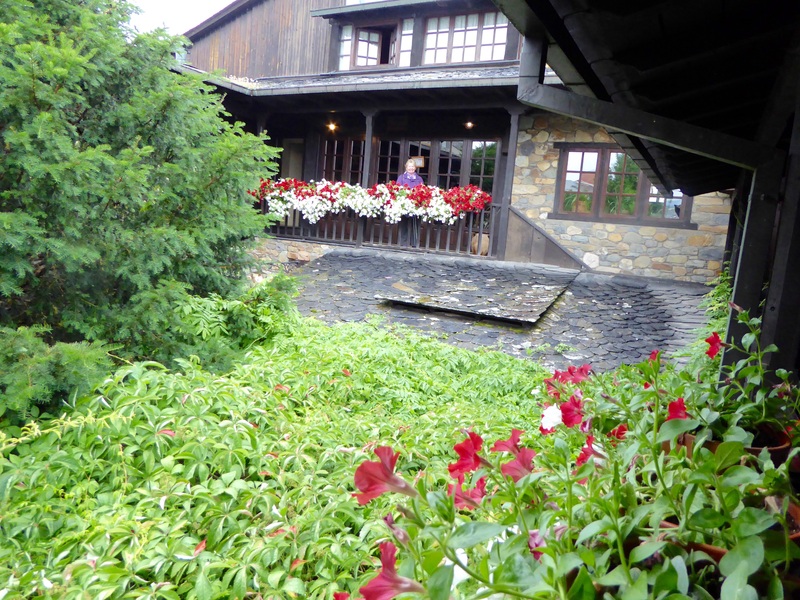 Here’s a funny one: our hotel was beautiful, meant to be rustic and done in countryside style. 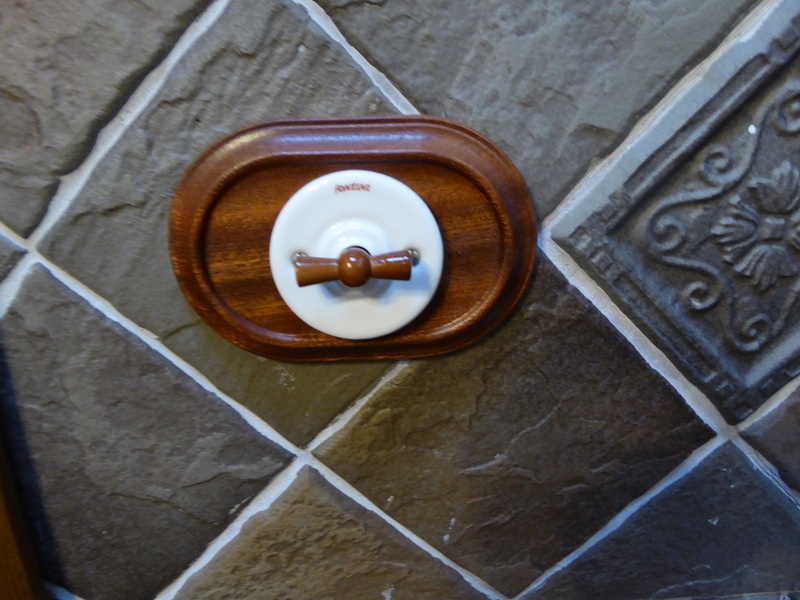 The light switches were built to resemble a piece of wood. This is to try to show the different styles of slate roofing. There is an old roof on the left with two newer on the right, the newer in the middle with different shaped slate tiles. Regarding the weather, ” the rain in Spain falls mainly on the plain” wow proved so true. Last night it poured and still was during breakfast this morning.